Magicicada cassini singing on hand from Roy Troutman. And a gallery of all these Brood XIV stragglers. Roy Troutman found this Brood XIV Magicicada straggler in the Cincinnati Ohio area this weekend. This cicada emerged 2 years after it should have. Amazing. According to messages left on this site, as well as the magicicada.org map, Brood II cicadas have emerged in New Jersey and New York. I’m in New Jersey, and I plan on looking for cicadas this weekend. Brood II stragglers are emerging (4 years ahead of schedule) in North Carolina, Virginia, Maryland, New Jersey and New York. Brood XIV stragglers are emerging (1 year after they’re supposed to) in Ohio. I found some skins in Metuchen, NJ tonight. Apologies for the quality of the photo — I only had my cell phone with me. So, we already know that Brood II stragglers are emerging in places like North Carolina and Virginia. Brood II cicadas weren’t due until 2013, which means the Brood II cicadas emerging now are emerging 4 years ahead of schedule. At the same time, Brood XIV stragglers are emerging in Ohio (Batavia, Ohio to be exact). Brood XIV emerged in full-force last year, which means some Brood XIV cicadas emerging now are emerging 1 year behind schedule. If you compare the Brood II map and Brood XIV map you’ll see they don’t overlap. Hint: open each map in a different browser or browser tab and toggle between the two. Here’s some pictures of the Brood XIV stragglers Roy Troutman found just tonight in Batavia, Ohio. Be on the lookout for Brood XIV stragglers? Be on the lookout for Brood XIV stragglers. 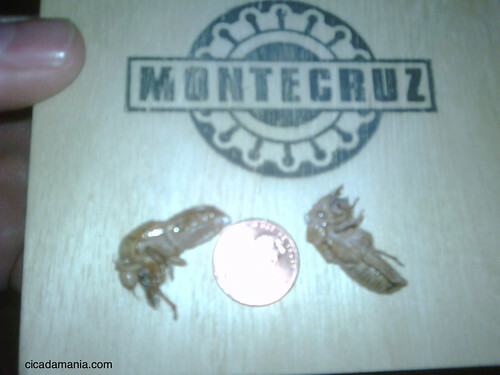 A few Magicicada that didn’t emerge in 2008 should appear in 2009! Keep your eyes and ears peeled. Here’s something special. Roy Troutman has uploaded some HD quality videos of Magicicadas to YouTube. Click the links to see the full-size versions.